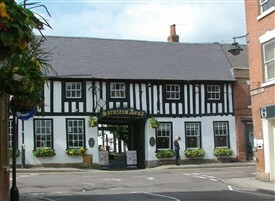 The saracen's Head Inn, Southwell: The milestone may be seen inset to the inn's wall just to the left of the archway. The milestone as it appears today. 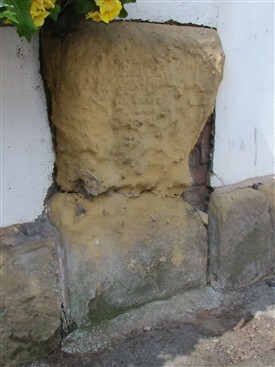 On the front of the Saracen's Head Inn in Southwell, just to the right of the carriage entrance at ground level, there is an ancient milestone set within the brickwork. 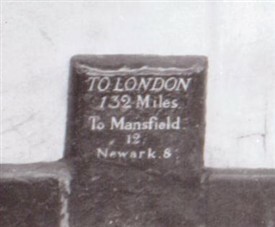 Today (2014) the milestone is worn away almost to nothing, but once recorded the ditances to London, Mansfield and Newark (See photos). 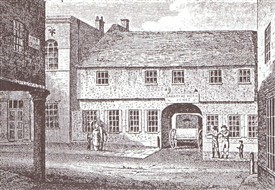 The exact date when the stone was erected is not known but its location may be clearly picked out on old prints of the town as far back as the 18th century: alterations to the facade of the Saracen's Head have taken place over the years, but appear to have left the milestone undisturbed. The deteriorating condition of the stone has been monitored for a number of years, and one early suggestion for its preservation involved extracting the stone and re-carving the original inscription on the back. There is a danger, however, that, once removed, the stone would disintegrate. The Southwell Civic Society's proposal involves sourcing new stone from the same quarry as the original, and having the original inscription re-carved by a local stonemason.